No piso inferior há uma sala, um quarto de casal, banheiro com chuveiro, cozinha totalmente equipada e sala de estar / sala de jantar. O terraço impressionante acessado a partir da sala de estar e está equipado com uma grande mesa de jantar, cadeiras, guarda-sóis e cadeiras de praia. Lá em cima há um grande quarto duplo com acesso a um terraço privado, também com vista para o mar deslumbrante, um segundo quarto com duas camas de solteiro e um banheiro com um chuveiro, onde a máquina de lavar é.
Todos os quartos têm grandes roupeiros embutidos. Os quartos no andar de cima e sala de estar são equipados com ar-condicionado. A área Ladera del Mar também tem um adorável grande piscina localizada no jardim, a apenas 50 metros da casa. 2 casas de banho com duche e WC. Máquina de lavar roupa disponível. I rented this unit because I thought the pictures looked nice. When we got there it was so much better than expected. Just being there and looking around you feel welcome and home. The views of the Mediterranean and the multitude of other homes in this area give you the sense of an exotic warm vacation spot. I enjoyed getting a little bit of exercise on all the stairs leading into the house. Amazing view (the picture is real!) This was a very comfortable house for our family of 5 on a 6day get-away. 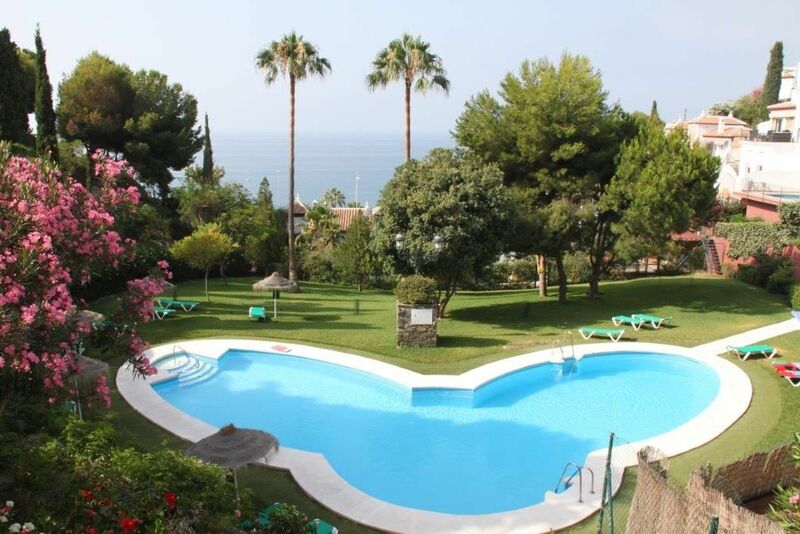 A great location just outside the city of Nerja - we were able to drive into the city, but found it convenient to take the bus. An easy day trip to Alhambra from here. And of course, lots of time enjoying the plentiful sunshine. The kids were anxious to get up and watch the sun rise each morning and wanted to be on the beach to watch the sun set in the evenings. The owners were very quick to respond to all questions before our arrival, and everything was perfectly arranged when we arrived. I highly recommend this property for its location, the views, and the owners. Mooie ruime vrijstaande villa, groot terras met een fantastisch uitzicht. De Lidl bevindt zich op 7 minuten rijden.Het strand is op loopafstand. Toller Urlaub im tollen Haus! Wir hatten einen tollen Urlaub. Die Villa hat eine fantastische Lage oberhalb des Meers, in nur 5 Minuten ist man zu Fuß am Strand. Zur Anlage gehört auch ein schöner Gemeinschaftspool. Das Haus ist komplett und großzügig eingerichtet, um einen sorgenfreien Urlaub zu verbringen. Der Kontakt mit Jimmy und Susan war sehr freundlich und perfekt. Fabulous! The Villa looked even better in person than it did online. We went with another couple, they had the upstairs bedroom, bathroom and their own terrace and we had the main floor bed and bathroom. The shared terrace was very large with a gorgeous view. Many condiments left for us in the kitchen. I hope we can return for more than five nights next time. I would highly recommend this home and thank Jimmy and Susan for letting us rent it. And Jimmy, the restaurant I remembered from our trip four years ago is still there and still delicious! Paradiso de Nerja! It is a paradise in Spain. We are so happy that you enjoyed your stay! Modern villa with a large south facing terrasse having panoramic sea view. I was very nice having you as our guests. We hope to see you again. Nerja é uma cidade costeira no sopé das montanhas Almijara com uma longa tradição de pesca e agricultura. Os pescadores ainda puxar as suas redes em terra na praia de Burriana. E em torno de Nerja são culturas de frutas e vegetais, e você pode comprar frutas e legumes diretamente da fazenda. O mercado semanal (terças-feiras) atrai muitos comerciantes e compradores de toda a região e do centro da cidade tem uma atmosfera vibrante e amigável, com muitas lojas encantadoras, bares de tapas e restaurantes. Check in: At the day of arrival at 3.00 pm if nothing else is discussed. Check out: The day of departure at 10.00 am if nothing else is discussed. Notera att priset kan diskuteras vid långtidshyra. Note that the price can be negotiable for long term rental.